Lorrie knits and sews: Sights around my neighborhood. I have this dog that I walk twice a day. 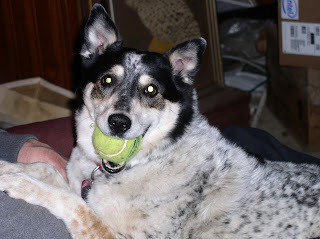 Here she is on her Daddy's lap. One of the places we pass each morning is a service station where the guys like to refurbish old cars. 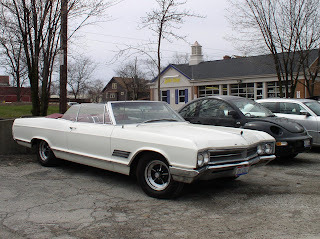 This is a vintage Buick. The size of it struck me. It is twice as long as the Beetle parked next to it. The mechanics here also make vehicles that you have never seen before. They made a push-me-pull you car that had two fronts. They also took an amusement park rocket car and turned it into a car. They use it for parades and street parties, giving rides to one and all. 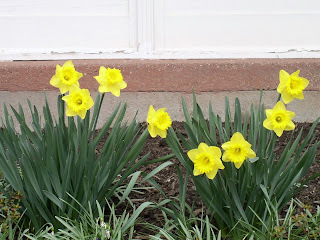 The flower of the week is daffodils. They are everywhere but in my yard, although I will have a few soon. There are big ones, small ones. 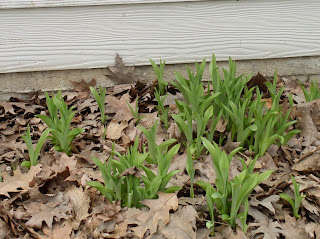 Our yard does have day lilies. Lots of day lilies. We see this tree on our evening walk. 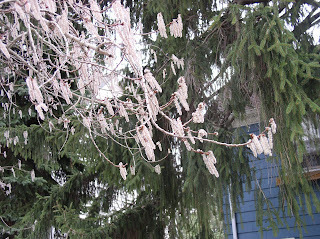 It has fuzzy "flowers" hanging from its branches. Does anyone know what kind of tree this is? Yards are being cleaned of winter debris. 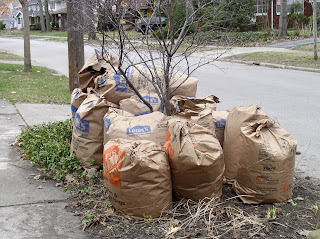 In our city, brown bags are used for yard waste which is collected by the city and taken to a park, where it turns into mulch. This is free, but requires a permit from the city. At work I have there tulips sitting on my air conditioner. Grow tulips, grow! 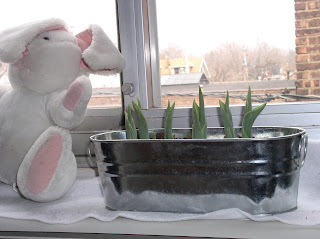 I also have bought pots of Spring flowers to help bring Spring indoors. When the flowers die, I put the plants in the ground for next year. I think I have as many daffodils as you have day lillies! I had some bulbs that I had inadvertantly left by the steps last fall. Even they are starting to grow.